MUMBAI, India – June 9, 2015 – Satcom Infotech, one of the leading value-added distributors focused on security solutions, today announced that they have been recognized by Sophos as the Best Distributor for 2014-15 in the awards distributed for Asia Pacific & Japan Region. Satcom was conferred with this award for their effective distribution strategy that has resulted in outstanding performance, increasing the sales of Sophos products by a whopping 100%. This, in turn, has had a tremendous impact on Sophos’ market share and brand visibility in the APAC region. This award is a validation of Satcom Infotech’s approach in offering solutions & services that address business & IT security challenges of customers through a focused partner network. Over the last few years, Satcom Infotech has built a reputation of being one of the most trusted VAD in India representing some of the best brands in the IT Security domain. 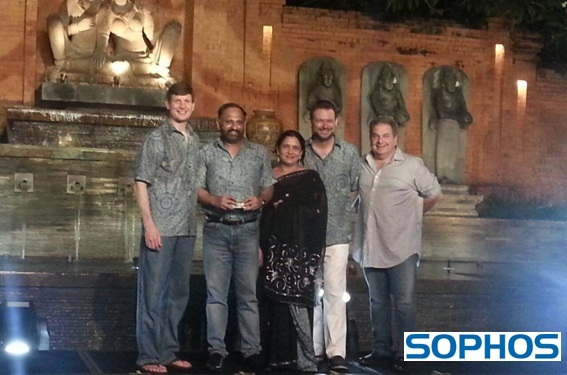 “We are extremely happy and proud to receive this award from Sophos. This is big milestone for Satcom Infotech and it will motivate our team to work even harder towards achieving further growth for Sophos in India. Our team of experts and distribution network combined with Sophos’ product portfolio has led to our continued growth. By partnering with Sophos, we believe we are able to offer our resellers the greatest value and advanced IT security solutions for their customers. I would like to dedicate this award to our entire team which has put in tremendous efforts to provide the best service, support and technical expertise for our customers,” said, Mr Vinod Kumar, Managing Director at Satcom Infotech. Satcom Infotech has a strong team of qualified and experienced professionals and engineers, who assist channel partners by training them on selling, implementing and supporting their vendor partners’ technologies. Satcom distributes entire product line of Sophos including Sophos Endpoint Protection, Sophos UTM, Sophos Email Protection and Sophos Encryption. These products offer complete protection and control to business, education, government organizations to safeguard themselves from all types of threats to reduce the cost and complexity in security management. The front-end teams of both Satcom and Sophos have worked in synergy to address the needs of its focused partner team across the country. “Satcom Infotech has shown tremendous commitment in promoting Sophos products in India. We would like to thank them and show them our appreciation through this award. They have demonstrated exceptional abilities in sales and distribution of our products and we believe they will continue to break barriers for us,” said Mr Stuart Fisher, MD & Regional VP- APAC at Sophos. Satcom Infotech Pvt ltd is India’s leading value added distributor and solutions provider in the security domain. Established in the year 2003 and headquartered in Mumbai, Satcom Infotech has been providing world class IT security solutions to a large number of channel partners and enterprises in India. Satcom Infotech has the best-of-breed security solutions from top security vendors like Sophos, GFI, Smoothwall, Infowatch and Wave. For more information please call +91 22-67911039/40/42 or visit www.satcominfotech.com. Find Satcom Infotech on LinkedIn. You are currently browsing the CHANGE AGENTS PR blog archives for the day Tuesday, June 9th, 2015.